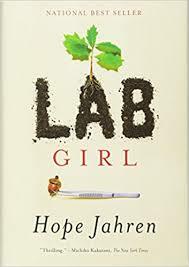 Lab Girl by Hope Jahren was a lyrically written and excellent book from a geochemist, geobiologist, and professor who studies trees, flowers, seeds, and soil. Jahren writes in the beginning how she grew up the daughter of a scientist in small town Minnesota, 100 miles from Minneapolis and how science appealed to her when young, with it being so much about doing and working with things. The book is about science and Jahren's love of it, but even more so, it's about her life and a friendship and work partnership that she formed while still a graduate student. There's great tales of she and her colleague Bill acting as co-conspirators in life and work, and traveling the world, with after meeting at Berkeley, stops in Atlanta, Baltimore, the Arctic, Norway, and Hawaii. In many ways, the book is like a traveling road trip story featuring two people on the same wavelength, both in how they interacted with each other and with students, teaching them to get into the muck and dive into their work. Jahren describes her work partner as being someone eclectic, loyal, and interesting, and it's really compelling reading on him. In relation to herself, Jahren writes of how she suffered from anxiety, mania, and debilitating depression and how after meeting her future husband, marrying, and becoming pregnant, how difficult it was to be off medication early in the pregnancy and she notes how a bipolar woman seven times more likely to have an episode while pregnant as when not. Jahren also details how when her son was about to start school, she and her family moved to Europe for a year, and recounts the story of her partner in crime Bill coming to visit, with him on the heels of dealing with having his elderly father die. It's just a really great story of friendship and Jahren at the end writes of both her family and Bill having moved to Hawaii and she saying goodnight to her son, writing of it with the memorable phrase that "raising a child is essentially one long, slow agony of letting go" and then leaving for the lab to work with Bill, where she'll "use the other half of her heart." Two additional things I enjoyed from the book were how Jahren uses one of my favorite words in doppelganger, and in the epilogue has an encouragement for people to plant a tree a year, perhaps an oak or something of a similar solid ilk.